Big jobs call for big roll-off dumpster containers – call the El Paso Disposal Roll-Off Service Hotline at 915-772-7600. El Paso Disposal provides an array of construction waste removal containers and open top roll-offs to suit the waste removal needs of any El Paso area construction site, large business, public event or cleanup. 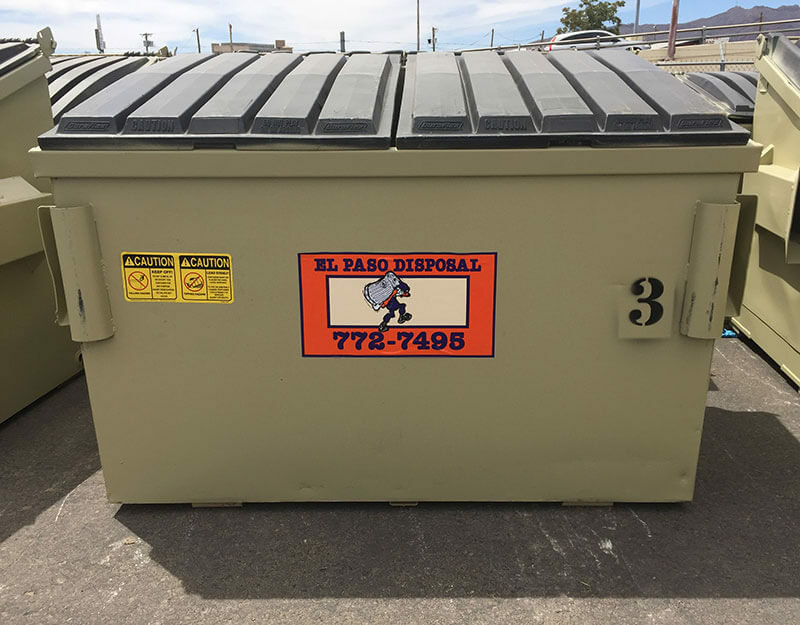 So, whether yours is a small home remodel or a large demolition project, choosing a construction waste roll-off dumpster from El Paso Disposal is the most convenient, cost-efficient, safe and timesaving trash containment option. Maximum weight limit for El Paso Disposal roll-off: 20,000 lbs. If you need a container that can be positioned closer to your Greater El Paso job site, ask about our special temporary 3-yard container service. These containers are the solution for smaller El Paso construction jobs and sites. 3-yard containers are ideal for preventing windborne debris. If you have a question or need service, call the El Paso Disposal Roll-Off Container Hotline at 915-772-7600. Roll-Offs should never be placed under any power lines; doing so puts El Paso Disposal vehicles and waste collection specialists in unnecessary danger. When filling with heavy material like dirt, rock, sand, plaster or sod, load roll-off container no more than half full to avoid excess weight. Payment terms will be determined upon setup of your Greater El Paso roll-off container job site.